In the fall, I took up a new instrument: the pedal steel guitar. "The what?" you might ask? Actually, if you're lucky enough to live in the world's finest city (Austin, TX) or know classic country music (e.g. Merle Haggard), you're not asking that, because you already know. But for the rest of you poor souls, I'll explain it. The pedal steel guitar is the king of instruments. It's a horizontal guitar, played with a slide, and makes use of various pedals & levers to change the pitch on individual strings. It's got an ethereal tone, and is unique among instruments in that its configuration allows chords and harmonies to "morph" continuously from one to the next without interruption. It is also maddeningly hard to learn, because you've got several dimensions to think about: bar position and angle, 3 foot pedals and 4 knee levers (which can be used in various combinations), 10 strings (usually played with 3 or 4 finger picks), and a volume pedal. It's kind of like playing chess on a unicycle at first. Why am I learning pedal steel guitar? Because it's my favorite instrument to listen to, and because I love a challenge. I took a couple lessons (from Neil Flanz and Bob Hoffnar) to get the basics down, but I'm mostly self-taught; I've put in nearly 150 hours of practice so far, and am now vaguely passable as a backing player (though definitely not a soloist yet). When I started in September, my goal was to be stage-ready by South By Southwest. And lo: here we are! I've already done my first gig, as a matter of fact - last week with my friends in Honky Kong at my favorite, Club Deville. That one was just to get the butterflies out, and did its job. But now, for the world's most famousest music festival, I offer, for your enjoyment, 2 shiny new gigs, with yours truly draggin' bar. The first is TODAY (Monday, 3/15) at the Mohawk at 8:15pm, backing up singer/songwriter Trey Brown. It's part of the ATX Emerge party. The second one is with my own new project, Branch & Steel, which is so hip that we don't even have a myspace page. It's comprised of me on the steel, and amazing guitarist John Branch, who will instead be playing piano. 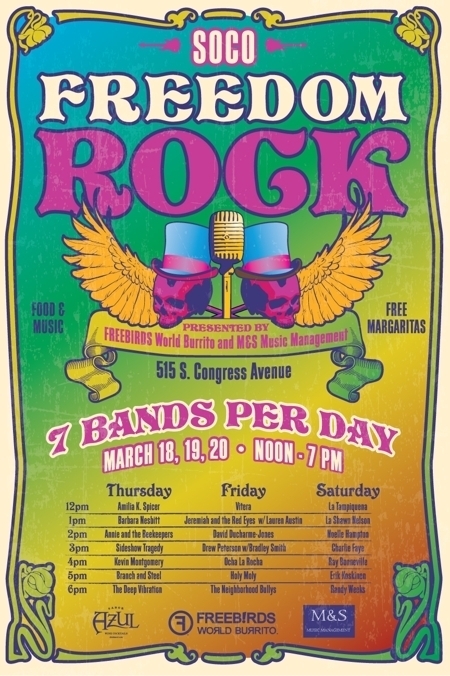 We'll be playing original compositions, pretty chill stuff, as part of the SoCo Freedom Rock party, which will also feature FREE MARGARITAS. So, if you've a mind to hear the mighty brought low, here's your chance. See me now, before I start refusing to play to crowds smaller than 10,000 again. By my prediction, that should be happening by June or so.